The core functionality is a phoenix/smartmouse interface, compatible with all Windows, Linux-based systems or embedded Linux-based systems like DreamBox, Set-top boxes (STB) or other industrial controllers. This is just one of the features of the Infinity USB Smart. The module-based approach makes it possible to install new modules or any other smartcard related functionality, even for standalone operation! Thanks to the module feature of the Infinity USB Smart, it now supports the Smartreader+ mode. The Smartreader+ mode will allow you to use the InfSmartreader module with 3rd party software that supports the Smartreader+ parameter. This parameter allows for the 3rd party software to automatically switch settings on the reader for optimum performance for the specific card used. 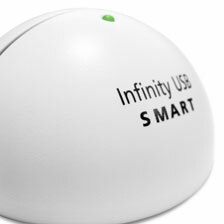 In order to make the Infinity USB Smart 'Smartreader+'-compatible all you have to do is install the InfSmartreader module, which is freely available with the latest setup software for the Infinity USB Smart. PasswordSafe is used for safe and secure password storage and distribution, on standard PIC or AVR based cards. Up to more than 1000 passwords can be stored on a single smartcard, and passwords are easily accessed with a custom shortcut key. PasswordSafe WinLogon can be used for enhancing the Windows logon security, by storing the Windows logon password on a PasswordSafe card.